Shanghai seems like a million miles and lifetimes ago. Blogging about our adventures keeps the memories alive which is good because right now I’m living life like an out of body experience. The jet lag has kicked in big time making it hard to sleep at the appropriate times of day and even harder to process information when I am awake. The good news is that our luggage has been found and will be delivered to us in London. We’ve adjusted our planned itinerary to account for the day we missed whilst stuck in Shanghai and allow our baggage to catch us up. Having done the emergency shopping, sorted out travel plans and know we’ll be reunited with out possessions, I finally feel like I can start relaxing into the UK part of our trip. Right now I’m trying to make sense of the differences in place and life between New Zealand, China and the UK. 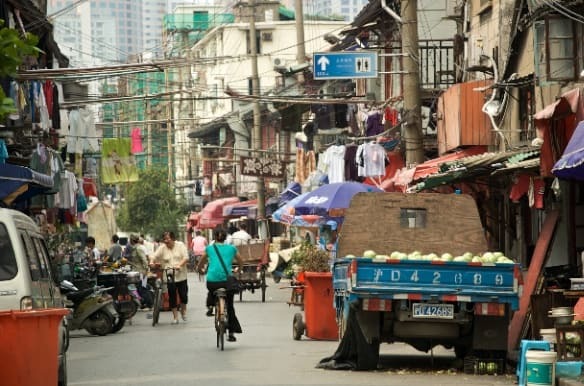 Amid the glitz and glamour of westernised China there is still a raw and real China to be seen. 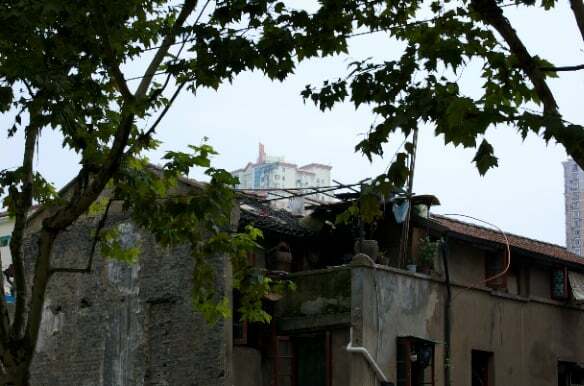 The China where people work and live in less glamorous surroundings but with all the richness and colour you’d expect. One of the things I enjoyed about our sightseeing is taking photographs as it increased by senses and made me look harder at what I was seeing. Time didn’t permit any specific foodie sights but I was content with seeing food retailing along the every day streets. 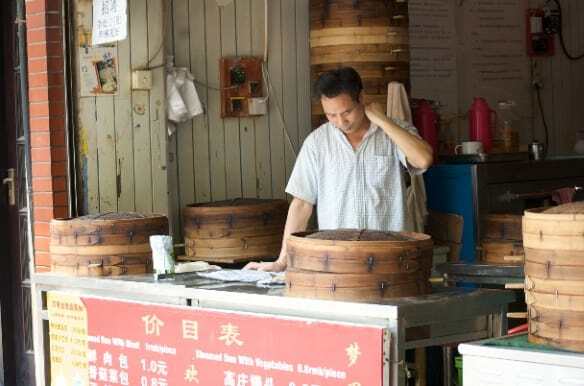 This shop caught my eye – he’s selling Steamed buns – as much for it’s specialism but also that he was taking time out to read the paper before what I am sure would have been a hectic day’s service. There were lots of similar places selling steamed food with queues of people outside. 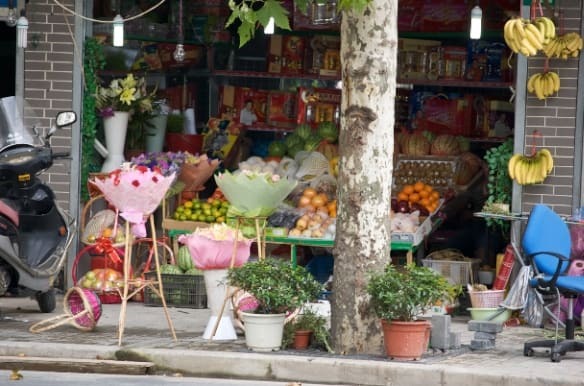 This street corner shop caught my eye for it’s brightly coloured fruit and flowers. Colour was all around us and it’s what gives Shanghai it’s vibrancy. But amongst the seemingly colourful scenes there are as many places that are clearly more challenging places to live. The thing that’s hard to rationalise is the fact that Shanghai has the new butted up against the ancient. The rich alongside the poor. Louis Vuitton close by the local markets. 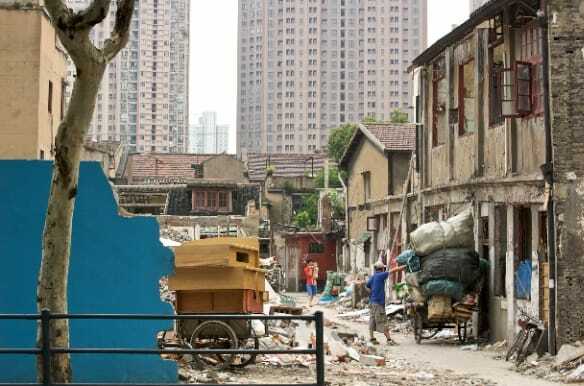 The gap between the haves and the have nots is very prominent and by all that’s written that gap is widening daily as some people prosper in the new Shanghai whilst the old is slowly demolished. 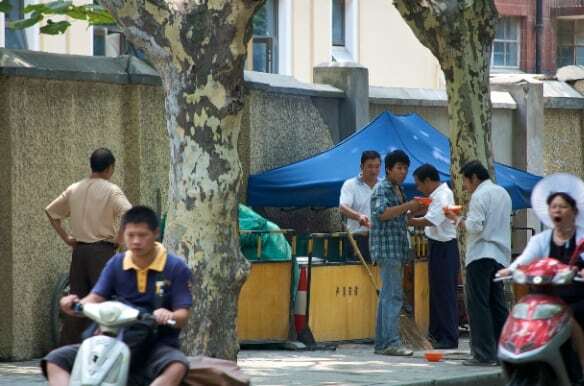 It’s clear that the lives of ordinary Chinese are changing and they have little choice in the pace or nature of change. They must simply pack up their belongings and move on. 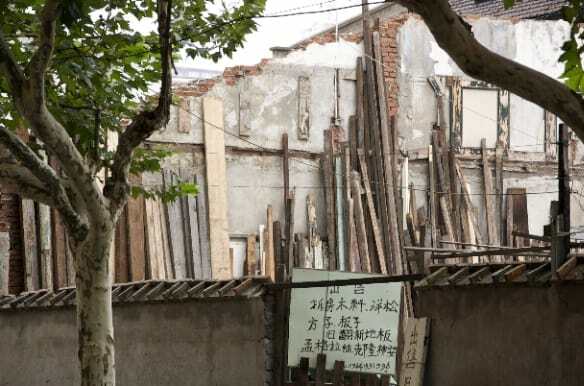 For in their place there is a new Shanghai to build. Here are the cabins built for the construction workers to live in. Although it is clear that some materials are being recycled although I suspect that this is the exception rather than the rule. 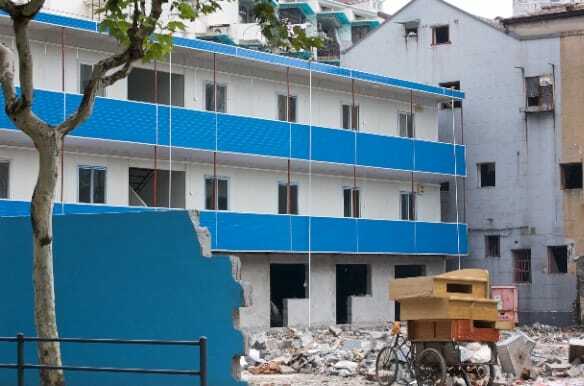 Some of the traditional housing has been jazzed up with a modern style. 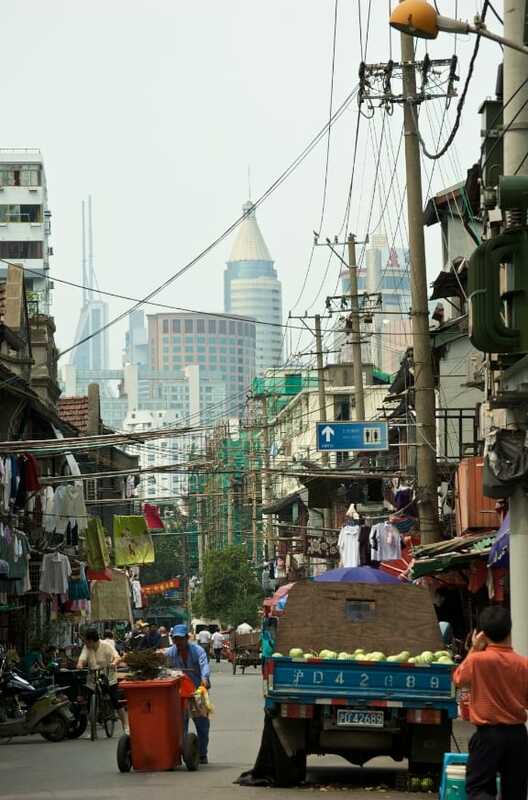 What’s clear is Shanghai is growing and changing. They are building a city for now and the future. And it’s people like these that are making those changes happen. But feeding the workers is a simple affair. A man in a fan with a pan of noodles. Simple food to fuel the labour. We walked for miles and miles in Shanghai and I enjoyed almost ever step of the way. The only exceptions were when we were hounded by watch and handbag touts trying to flog fake designer gear. The downside of only having a few days in town is that you have to keep focused on what you wanted to see and do. I would love to have spent more time poking around local markets and people watching as they go about their every day lives but time just didn’t permit. 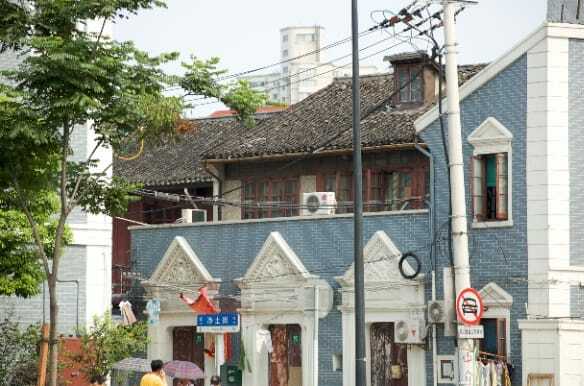 In this trip we were intent on capturing a flavour of Shanghai rather than getting to know it intimately. I have a couple more Shanghai posts to complete my blog journal of the trip. What’s becoming clear to me as I relive my Shanghai travels is that this is a place I’d like to return to again. To explore more and extend the enjoyment possible from such a dynamic and vibrant place. So many stark contrasts, which your words and photographs sum up so poignantly. Such rapid change and growth. Your photographs capture the changes so clearly that is like watching time moving on through a kaleidoscope of colours; some rich, some poor.